Desktop PCs typically have USB ports on the front panel of the enclosure. Internal cable assemblies are usually used to connect the external USB ports on the front panel to the motherboard. The internal cable assembly may connect the motherboard to the external USB ports via a daughter card, bringing the necessary signals to the USB ports. The USB Standard-A connector is mounted on the daughter ...card, accessible to an end-user from the front of a chassis. Figure 1-1 illustrated the USB 3.0 interconnect topology. Alternatively, the internal cable assembly may directly connect to the external USB ports, the Standard-A connectors, without the daughter card. 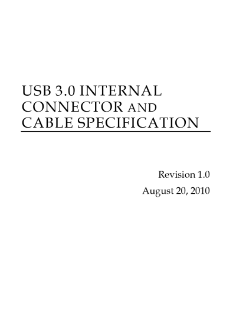 This document describes the internal cable interface for USB 3.0 implementation in desktop. It focuses on the electrical and mechanical requirements of the connector and cable assembly. The detailed daughter card or direct-cable implementation is out of the scope of this documentation. For the purpose of discussion, it is assumed that the front-panel implementation involves a daughter card. The USB 3.0 internal cable connector A, or USB3 ICC A, is mounted on the motherboard, while the USB 3.0 internal cable connector B, or USB3 ICC B, is mounted on the daughter card.